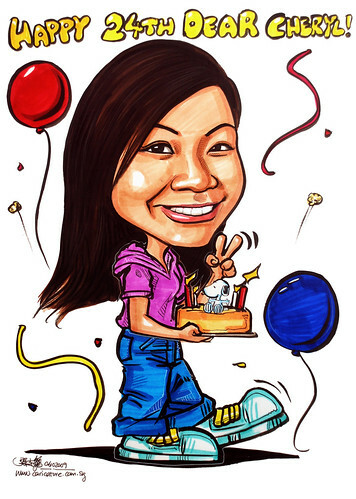 I would like to order this birthday theme caricature for my cousin's 24th birthday! I have ran out of ideas over the years for her birthday and was really happy upon knowing your website for caricature! I would want to do the caricature in colour marker with theme - with background & body. The theme would be party with balloons, poppers, confetti, masks or anything that fits as background and at the foreground would be the birthday girl, her sister and myself with a snoppy cake as she likes snoppy. I have attached pictures for your reference the pictures had been labeled with "birthday girl" the one to be drawn in the center maybe all of us with a party hat if possible. Oh and i want the wordings to be "Happy 24th Dear Cheryl"